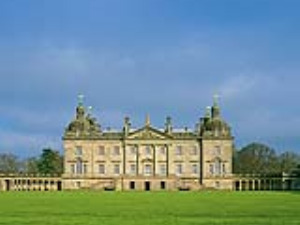 Group Visits at Houghton Hall & Gardens01485 528569work Group VisitsExquisite Palladian mansion with state rooms built in 1720s for Sir Robert Walpole, Britain's First Prime Minister. William Kent interiors. Award winning 5-acre walled garden. Contemporary sculptures in gardens and grounds. Deer park. Model soldier Museum. Damien Hirst exhibition Colour Space Paintings & Outdoor Sculptures. Café, Gift Shop, picnic and play area. A perfect day out. Pre-booking essential for private guided tours. Group sizes - min 20, max 60, full catering facilities (60 covers), Private guided tours by arrangement, free coach parking, Gift Shop. Pre-booking essential. Exquisite Palladian mansion with state rooms built in 1720s for Sir Robert Walpole, Britain's First Prime Minister. William Kent interiors. Award winning 5-acre walled garden. Contemporary sculptures in gardens and grounds. Deer park. Model soldier Museum. Damien Hirst exhibition Colour Space Paintings & Outdoor Sculptures. Café, Gift Shop, picnic and play area. A perfect day out. ACCESSIBILITY: Lift up to state rooms in hall. Flat entry to ground floor. Gravel paths and grass areas in walled garden and park. Mobility scooters available in gardens. Private group tours by arrangement. Please e-mail info@houghtonhall.com or call 01485 528569 for more details or to make a booking.